Science can explain why Hurricane Florence is threatening my home. But it can’t interpret it. On Ash Wednesday 1962, the dead didn’t just rise again. They floated. The Ash Wednesday Storm of 1962 was one of the worst storms to hit the Eastern seaboard in modern memory. One of the places hardest hit was Chincoteague Island, a tiny barrier island off the coast of Virginia. As the island flooded, and residents scurried into their upstairs bedrooms, the tidal surge was so great that it sucked the wooden burial vaults out of the ground. The dead floated down Taylor Street. Everyone alive has experienced the storm—maybe it was a hurricane, maybe it was a nor’easter, maybe it was a tornado, or gale, or earthquake. 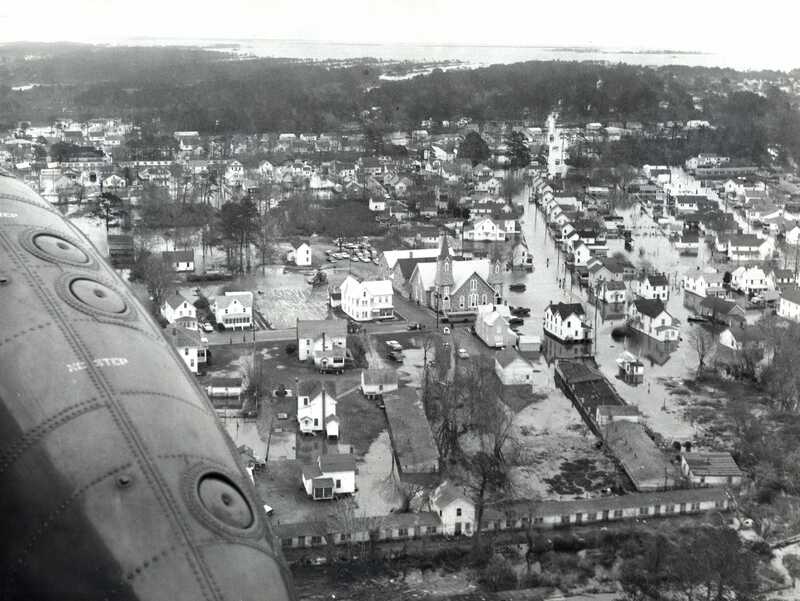 I grew up hearing the stories of my grandparents being airlifted off of Chincoteague by US Navy helicopter the day after the 1962 storm. In 2015, I watched as the flood waters of the 1,000-Year Flood rose across my yard and ran under my house. Each one is a unique event, the sum and total of which is unexplainable from our limited, human perspective. The night before the Chincoteague storm, waterman Herman Fitchett told his daughter, “The barometer is the lowest I’ve ever seen it in my life. Something bad is going to happen.” Still, in 1962, the residents of places like Chincoteague had relatively little warning. Times have changed. As Hurricane Florence bears down on the Eastern seaboard, coastal communities like Chincoteague are under mandatory evacuation. At time of writing, Florence is a Category 4 hurricane, a tropical cyclone with winds of up to 130 mph. In 1962, the Weather Service wasn’t able to predict the Ash Wednesday Storm. Today we have Doppler radar that allows us to watch the hurricane’s every move. Modern science has provided us with the remarkable ability to explain weather patterns on Earth—explanations that ancient people would never have understood. But just as storms make us stop and pay attention today, they did the same to ancient people. One of the most well-known passages of the Bible that speaks of the storms of our world is Job 37. When Job writes about storms, no easy answer is given. Prophetically, Job tells us, God “does great things beyond our understanding” (Job 37:5). Christians spend an inordinate amount of time trying to explain God: who God is and how God works. And this is a good thing; our wonder and curiosity reflect the image of God in our lives. But often when God acts, there is no explanation. We can only be a witness to it. When we read the stories in the Bible of how Jesus walked on water, multiplied the loaves, and calmed the sea, the temptation that sets in for modern readers is to try to explain in human terms what God is doing. Yet, as our power to explain the natural world has increased in the modern era, our ability to experience the acts of God have decreased. That’s because when God acts, it may be that we are not meant to explain it in human terms but only to be a witness to what God does. I love the way Matthew records an unexplainable event in his gospel. After Jesus’ death on the cross, he writes: “The earth shook, the rocks split and the tombs broke open. The bodies of many holy people who had died were raised to life. They came out of the tombs after Jesus’ resurrection and went into the holy city and appeared to many people” (Matt. 27:51–53). And that’s it. Matthew writes of an event that if experienced today, the amount of explanation we modern people would try to give for it would be limitless. Yet, Matthew’s matter-of-fact description suggests that what happened simply cannot be explained. You had to be there to see it. As I watch the radar images of Hurricane Florence bearing down on my location, I am reminded of the great blessing modern science gives us in its power to explain phenomena that our ancestors could only guess at. But the explanatory power of scientific theories is eternally limited. As G. L. Pandit points out, theories explain problems that we know of beforehand, but their use also always introduces us to new problems that require further explanation. The miracles that Jesus did point us to the power of God that works in our world and in our lives. Jesus didn’t ask his disciples to explain his miracles to others, he simply asked that they be witnesses to it. When we see God act in powerful ways, we bear witness. When we see people serve others in weak ways to God’s glory, we bear witness. We grieve over the devastation wrought by storms like Florence, we do we all can to help storm victims in Christ's name, yet we still acknowledge even in our grief that "his way is in the whirlwind and the storm" (Nahum 1:3). In these and every circumstance, we serve as witnesses so that who God is may be known throughout our world (Acts 1:8). You can predict the storm, you can track the storm, you can prepare for the storm, but you can’t interpret the storm. You can only witness it. Douglas Estes is associate professor of New Testament and practical theology at South University. He is the editor of Didaktikos, and his newest book is Braving the Future: Christian Faith in a World of Limitless Tech. A deeper problem lies beneath recent stories of swelling rivers, soggy small towns, and feel-good relief efforts.